The novel “Out of This World” by Murray Leinster was published for the first time in 1958 fixing up three stories published in 1947 in the magazine “Thrilling Wonder” as William Fitzgerald. Bud Gregory is a mechanic so lazy that he works only when he needs money to support his family. When he’s offered good money to fix a car, he does it his own way, inventing a solution that seems impossible. However, his action has a series of unanticipated consequences. David Murfree is a physicist at the Bureau of Standards who discovers what Bud Gregory has done by chance. Finding someone who has a deep understanding of the laws of physics which is completely intuitive since the mechanic is semi-illiterate is incredible but also very frustrating because of his attitude but he could be the only one who has a solution for seemingly impossible problems. Murray Leinster started his writing career before science fiction had a name, publishing tales of different genres on pulp magazines using different pen names. He had already accumulated several years of experience when he published three stories containing the adventures of Bud Gregory, a truly unique mechanic and his unlikely friend David Murfree. After a decade those tales were fixed-up in “Out of This World”, which was labeled as a novel even though it contains three separate stories that have the same protagonists. The three stories were written after the end of World War II and the beginning of the Cold War, a period in which science fiction was caught between the old optimism regarding scientific and technological progress and the new fears for their consequences. The stories that form “Out of This World” reflect that situation by showing Bud Gregory’s amazing inventions but also some possible negative consequences of their use not to mention other people’s inventions used for war purposes. The plot of each of the three stories is based on very similar patterns with some variations on Bud Gregory’s inventiveness and the strange relationship that develops with David Murfree. The plots include very serious threats and yet the general tone is rather lighthearted, so much so that the two protagonists somehow form a double act with the contrast between their personalities and the often funny results of their interactions. Gregory is a semi-illiterate man who makes of laziness a philosophy of life so he’s only interested in living in peace while Murfree is a physicist who obtained a regular degree with a very practical attitude and pays a lot of attention to external threats. The consequence is that Murfree must always struggle to convince Gregory to do a job even if something very important is always at stake. The gimmicks behind Bud Gregory’s inventions have no real scientific basis: the mechanic explains what he intends to do or what he did if he explains it later using simple words and David Murfree gives them a more rigorous interpretation from the scientific point of view but without offer real explanations about how he created equipment that can do seemingly impossible things. Murray Leinster plays mainly on the two protagonists and on Murfree’s frustration when he sees how Gregory easily invents something. At the beginning all this can be fun, but the plots of the tales are rather thin and repetitive. They’re focused on inventions and on the two protagonists with everything else in the background sometimes unlikely, given that only the two protagonists have a definite personality and there are events that are functional to the plot such as the Americans who go into total panic at the first threat from a European power. In 1948 Murray Leinster published a fourth Bud Gregory story – “The Seven Temporary Moons” – but it wasn’t included in the novel. 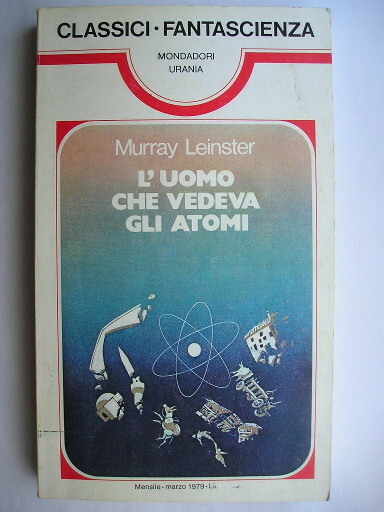 Overall, “Out of This World” is definitely not among Murray Leinster’s best works and is among the ones that aged quite badly over the decades. Today it’s readable as a science fiction comedy but keeping in mind that it’s an elementary science fiction from the pulp magazines era.